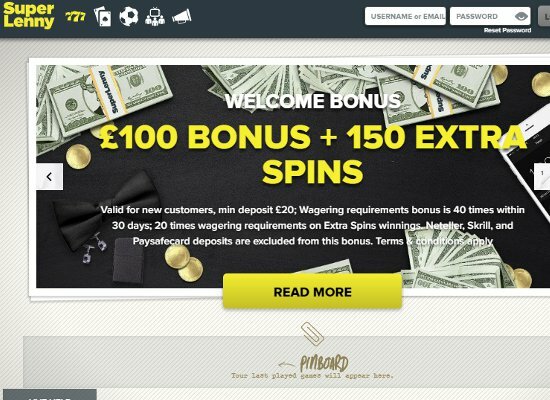 Titanbet Casino UK offers players a fantastic welcome bonus, with the first deposit receiving a 200% bonus. This bonus has a maximum bonus value of £300 and requires a minimum deposit of £35 be made in order to qualify. The welcome package is exclusive to UK residents and deposits via Moneybookers. 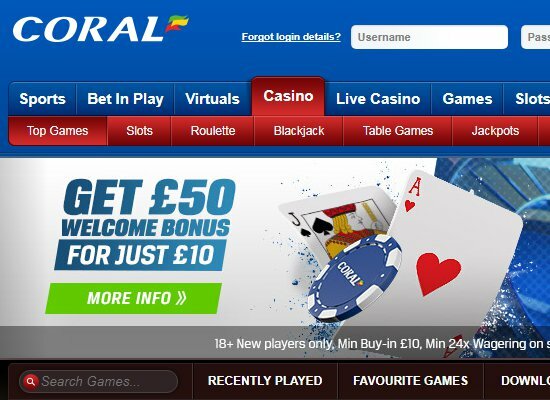 Skrill and Neteller are not eligible for the welcome bonus. Both the deposit and bonus carry playthrough terms of 30x, and all bonus monies will expire 30 days after activation. 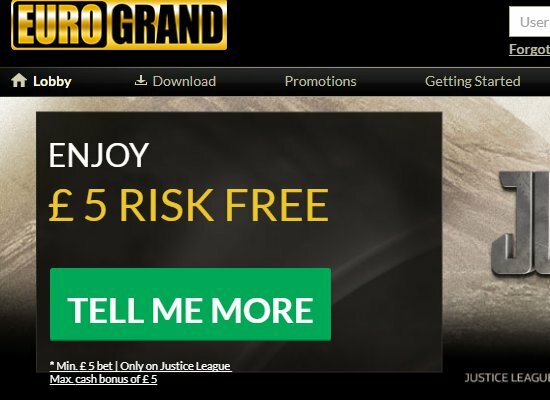 Titanbet members enjoy some of the most rewarding promotions and bonuses in the industry and loyalty is appreciated through the unique VIP program. It offers amazing benefits, including higher withdrawal limits, Sunday bonuses up to £200, and a higher comp to cash conversion rate. 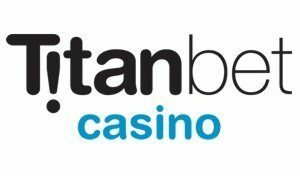 Established in 2008, Titanbet Casino is regulated and licensed by the UK Gambling Commission and operated by PT Entertainment Services. 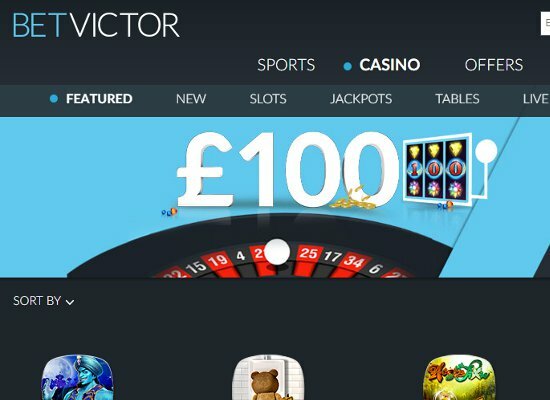 Rated as one of the best online casinos in the UK, Titanbet offers players the opportunity to enjoy; sports, in-play, virtual gaming, poker, casino games, live casino games, as well as entertainment offered via its recently added Macau section. Powered by Playtech, Titanbet Casino is certified as 100% safe and secure, while the casino maintains a transparent and secure gaming environment. All games are tested by Gaming Laboratories International (GLI), and underage gambling is strictly forbidden. The casino offers both free download and instant play gaming options. 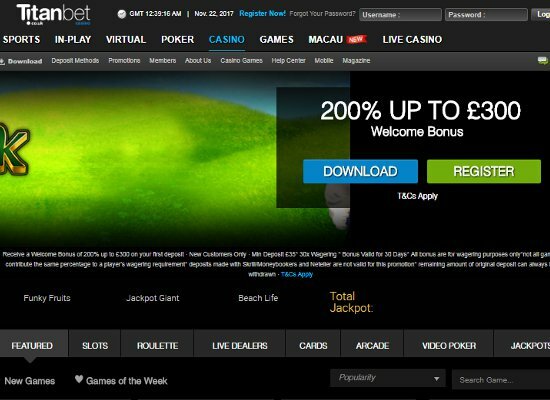 Titanbet Casino’s online entertainment options include; sports, live casino, games, casino games, poker and Macau. The newly added Macau section focuses on Asian themed slots, jackpots, cards and live gaming options. UK players can enjoy over 400 Asian slots, including exciting games such as Nian Nian You YU and Fei Cui Gong Zhu. The casino section offers featured games, slots, roulette, live dealer games, arcade games, video poker and jackpots. Famous slots include Ghost Train Fairground Fortunes, Hologram Wilds and Legacy of the Wilds. While popular licensed slots such as Monty Python and the Holy Grail, Robocop, The Flintstones and The Love Boat are available. A broad range of progressive jackpots are offered and include; Beach Life, Gladiator, Who Wants to be a Millionaire, Superman and the Age of the Gods series of games. The games section classifies games according to themes including adventures, animals & nature as well as sport & leisure. While the most popular adventure games include Alien Hunter, Cowboys and Aliens, Darling Dave & the Eye of Ra and John Wayne. Live dealer games such as Live Sic Bo, Live VIP Roulette, Live Baccarat Progressive and Live Unlimited Blackjack are popular choices for players who enjoy an authentic online experience. Members can also enjoy games via iOS and Android mobile devices by entering their mobile number on the site, scanning the QR code or visiting mgaming.titanbet from their mobile browsers. Mobile users enjoy weekly pay-back bonuses worth up to £250 every Wednesday, via a mobile exclusive promotion. Payment methods usable by desktop and mobile players include; Visa, MasterCard, Maestro, Diners Club, Skrill, Neteller, Bank Transfer and PayPal, while all transactions are processed in GBP. Support at Titanbet Casino is offered via email, phone 24/7, fax and post, while live chat is also available 24 hours a day. New members can also get detailed information regarding how to install the casino on their phone, game help, privacy and security in the FAQ section, while additional assistance is also offered to mobile users through several social platforms such as Facebook.